Since 2008, when we launched intelNews, it has been our end-of-year tradition to take a look back and highlight what we believe were the most important intelligence-related stories of the past 12 months. In anticipation of what 2019 may bring in this highly unpredictable field, we present you with our selection of the top spy stories of 2018. They are listed below in reverse order of significance. This is part three in a three-part series; part one is available here. Part two is available here. 04. China flexes its HUMINT muscle. Much has been written about China’s cyber-espionage capabilities. These are undoubtedly formidable and growing. But in 2018 Beijing also showed that it is becoming increasingly active in human intelligence —namely the use of human spies to clandestinely collect information. In January, the FBI arrested Jerry Chun Shing Lee, 53, who served in the CIA from 1994 to 2007, accusing him of having received “hundreds of thousands of dollars in cash” by China in exchange for carrying out espionage. In May, France confirmed the arrests of two French intelligence officers who are accused of spying for the Chinese government. The suspects are current and former officers in the General Directorate of External Security (DGSE), France’s primary external intelligence agency. At least one of the two suspects was reportedly stationed at the embassy of France in Beijing when French counterintelligence became aware of his alleged espionage. And in October the DGSE, along with France’s domestic security agency, the DGSI, warned of an “unprecedented threat” to security after nearly 4,000 leading French civil servants, scientists and senior executives were found to have been approached by Chinese spies using the popular social media network LinkedIn. 03. The Islamic State is quickly evolving into a clandestine organization. Earlier this month, US President Donald Trump announced that the Islamic State, also known as the Islamic State of Iraq and Syria (ISIS) had been defeated and that the he would be removing all US forces from Syria. Virtually no Western intelligence agency agrees with the view that ISIS has been defeated. In August, the US Department of Defense reported to Congress that ISIS retains over 30,000 armed fighters in Iraq and Syria. Another report by the United Nations’ Analytical Support and Sanctions Monitoring Team warned that ISIS is morphing into a “covert version” of its former self and that its organizational core remains mostly intact in both Iraq and Syria. Earlier this month, the US Pentagon warned again that ISIS is swiftly returning to its insurgent roots, as observers in Iraq and Syria cautioned that the group is witnessing a revival. What is more, recent analysis by the Pulitzer Center on Crisis Reporting says that a campaign of revenge by Iraq’s Shiite-dominated government against Sunni Arabs in regions once controlled by ISIS is aiding Islamists and fueling another pro-ISIS rebellion in the country. Overall, there are today four times as many Sunni Islamist militants in the world than on September 11, 2001, according to a study published in November by the bipartisan Center for Strategic and International Studies in Washington. 02. Nearly 150 Russian diplomats were expelled by 24 countries over Skripal poisoning. Relations between Russia and much of the West reached a new low this year, with the expulsion of nearly 150 Russian diplomats from two dozen countries around the world. The unprecedented expulsions came in response to Britain’s worldwide diplomatic effort to condemn Russia for the attempted assassination of former Russian spy Sergei Skripal in Salisbury, England, which was allegedly carried out by Russian government agents. They were publicized with a series of coordinated announcements that were issued from nearly every European capital, as well as from Washington, Ottawa and Canberra. By the early hours of March 13, the number of Russian diplomatic expulsions had reached 118 —not counting the 23 Russian “undeclared intelligence officers” that had been expelled from Britain the previous week. As intelNews explained at the time, the expulsions sent a strong political message to Moscow and did disrupt the Kremlin’s intelligence activities in the West. But they are expected to have a limited effect on Russia’s ability to carry out intelligence operations on foreign soil of the kind that allegedly targeted Skripal. 01. CIA suffered ‘catastrophic’ compromise of its spy communication system. That was alleged in a major report published by Yahoo News, which cited “conversations with eleven former US intelligence and government officials directly familiar with the matter”. The report described the compromise of an Internet-based covert platform used by the CIA to facilitate the clandestine communication between CIA case officers and their sources —known as agents or spies— around the world. It reportedly caused a “catastrophic” compromise of the system that the CIA uses to communicate with spies, which caused the death of “dozens of people around the world” according to sources. What is more, the report suggested that the CIA was warned about the potential shortcomings of its online communication system before 2009, when the first penetrations began to occur. In response to the compromise, the CIA has reportedly modified, and at times completely abandoned, its online communication system. However, the implications of the system’s compromise continue to “unwind worldwide” and the CIA is “still dealing with the fallout”, according to Yahoo News. The effects on the agency’s operational work are likely to persist for years, it said. This is part three in a three-part series; part one is available here. Part two is available here. Since 2008, when we launched intelNews, it has been our end-of-year tradition to take a look back and highlight what we believe were the most important intelligence-related stories of the past 12 months. In anticipation of what 2019 may bring in this highly unpredictable field, we present you with our selection of the top spy stories of 2018. They are listed below in reverse order of significance. This is part two in a three-part series; part one is available here. Part three is here. 07. Russia accused of using ISIS hacker group as cover to launch cyber attacks. The group calling itself Cyber Caliphate first appeared in early 2014, purporting to operate as the online wing of the Islamic State of Iraq and Syria (ISIS), which later renamed itself Islamic State. Today the Cyber Caliphate boasts a virtual army of hackers from dozens of countries, who are ostensibly operating as the online arm of the Islamic State. Their known activities include a strong and often concentrated social-media presence, as well as computer hacking, primarily in the form of cyber-espionage and cyber-sabotage. But a report issued in October by Britain’s National Cyber Security Centre described the Cyber Caliphate and other similar hacker groups as “flags of convenience” for the Kremlin. The report echoed the conclusion of a German government report that was leaked to the media in June of 2016, which argued that the Cyber Caliphate is a fictitious front group created by Russia. 06. Outgoing CIA director said US killed ‘couple of hundred’ Russians in Syria. Sources from the US Pentagon, said that the armed confrontation took place on February 7, 2018, when a 500-strong Syrian government force, which allegedly included hundreds of contracted Russian soldiers crossed the Euphrates River and entered Kurdish-controlled territory in Syria’s northeastern Deir al-Zour region. US-supported Kurdish forces in the area, which include embedded American troops, responded with artillery fire, while US military aircraft also launched strikes on the Syrian government forces. The latter withdrew across the Euphrates after suffering heavy losses. The US side is said to have estimated at the time that over 100 attackers had been left dead, with another 200-300 injured. The toll later rose to nearly 400 dead. At a press conference held soon after the armed clash, US Secretary of Defense James Mattis refused to discuss the matter. But on April 12, the outgoing director of the CIA, Mike Pompeo, appeared to acknowledge that US troops killed hundreds of Russians in Deir al-Zour. He was speaking before a committee of the US Senate during a hearing pertaining to his nomination to serve as the next US secretary of state. Pompeo said that: “in Syria, now, a handful of weeks ago the Russians met their match. A couple of hundred Russians were killed”. 05. Iran tried to bomb conference in France with over 30 senior US officials present. On June 30, members of Belgium’s Special Forces Group arrested a married Belgian couple of Iranian descent in Brussels. The couple were found to be carrying explosives and a detonator. On the following day, German police arrested an Iranian diplomat stationed in Iran’s embassy in Vienna, Austria. And on the same day, a fourth person was arrested by authorities in France, reportedly in connection with the three other arrests. All four individuals appear to have been charged with a foiled plot to bomb the annual conference of the National Council of Resistance of Iran (NCRI) that took place on June 30 in Paris. The NCRI is led by Mujahedin-e Khalq, a militant group that was designated as a terrorist group by the European Union and the United States until 2009 and 2012 respectively. But it has since been reinstated in both Brussels and Washington, reportedly because it provides the West with a vehicle to subvert the Iranian government. NCRI conference participants included over 30 senior US officials, including US President Donald Trump’s personal lawyer, Rudy Giuliani, who addressed the meeting. Stephen Harper, Canada’s former prime minister, also spoke at the conference. This is part two in a three-part series; part one is available here. Part three is here. Since 2008, when we launched intelNews, it has been our end-of-year tradition to take a look back and highlight what we believe were the most important intelligence-related stories of the past 12 months. In anticipation of what 2019 may bring in this highly unpredictable field, we present you with our selection of the top spy stories of 2018. They are listed below in reverse order of significance. This is part one in a three-part series; Part two is available here. Part three is here. 10. Taiwan admits that Chinese general Liu Liankun was one of its spies. In April, the government of Taiwan acknowledged publicly for the first time that Liu Liankun, a Chinese major general who was executed by Beijing in 1999 for espionage, was indeed one of its spies. Liu, who headed the Department of General Logistics of the Chinese People’s Liberation Army, was accused by the Chinese government of having spied for Taiwan for five years, in exchange for nearly $2 million in bribes. He was eventually executed by lethal injection in a Beijing prison. He was 58. At the time of his conviction, Liu was the most senior Chinese military officer to have ever been convicted of spying for Taiwan. The island nation denied that Liu spied on its behalf and refused to acknowledge that it had any role in his espionage activities. But in April Taiwan’s Military Information Bureau unveiled its renovated memorial at its headquarters in Taipei City. Among the plaques, visitors to the memorial saw one dedicated to Liu for the first time. 09. Israel charges former cabinet minister with spying for Iran. In 1992, when he was 35, Gonen Segev, was elected as one of the Knesset’s youngest members, representing the conservative Tzomet party. Initially an opposition Knesset member, Segev eventually left Tzomet and joined a governing coalition with the Labor Party, in which he served as Minister of Energy and Infrastructure. In 2004, after exiting politics, Segev was arrested on a flight from Holland while reportedly trying to smuggle several thousand ecstasy pills into Israel. He was jailed for five years but was released from prison in 2007, after a commendation for good conduct. Shortly after his release, Segev moved to the Nigerian city of Abuja, where he practiced medicine. It was there, the Shin Bet claims, that he was recruited by Iranian intelligence. He was reportedly detained in May of this year during a trip to Equatorial Guinea, following a request by Israeli officials. He was then extradited to Israel and arrested as soon as he arrived in Tel Aviv. Israel’s Shin Bet security service said that Segev admitted being in regular contact with Iranian intelligence agents in Nigeria, where he lived after 2007, and other countries around the world. He also said that he was given a fake passport by his handlers, which he used to visit Iran on two separate occasions in order to hold secret meetings with Iranian intelligence officers. 08. European Union agrees to establish joint intelligence training school. In November, 25 members of the European Union agreed to establish a joint intelligence training academy, a move interpreted by some as a concrete effort to deepen inter-European security cooperation following Brexit. The announcement came just hours after leading EU heads of state spoke in favor of establishing a joint EU defense force. Calls for tighter cooperation between EU members in the areas of defense and security have been issued for decades. But the upcoming departure of Britain from the EU —popularly known as Brexit— appears to have prompted Germany and France to propose deeper integration as a response to the rise of anti-EU sentiment across the continent. 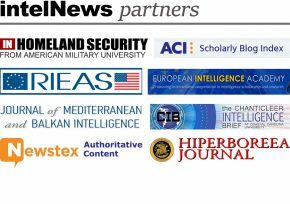 The new intelligence academy initiative will be led by Greece —an EU member since 1981— and will be headquartered in Cyprus, which joined the EU in 2004. It will work in cooperation with the individual intelligence agencies of the 25 co-signatory states, along with NATO and with other regional security bodies. This is part one in a three-part series; Part two is available here. Part three is here.